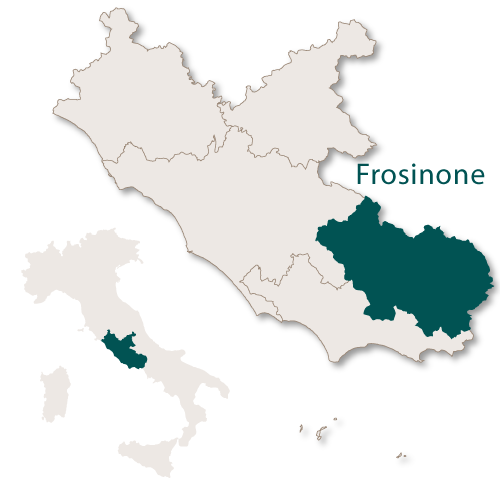 The Province of Frosinone covers an area of 3,244 sq.km and borders the region of Abruzzo to the north east, the region of Molise to the east, the province of Latina to the south west and the province of Roma to the west and north west. This little visited area of Italy is steeped in history, all of which is reflected in its many beautiful villages set among the green countryside. The terrain is diverse with mountains insterspersed with green hills which in turn lead to deep, sweeping valleys criss-crossed by rivers and hiding a complex system of caves and subterranean lakes. Within this underground maze of stalactites and stalagmites there have been many discoveries, some dating back as far as the Bronze Age. This is the captal city of the province of Frosinone and sits on top of hill which overlooks the valley surrounding the Sacco River. The city is totally surrounded by the Ernici and Lepini mountain ranges. The old city centre is located at the highest point whilst the more modern parts lie on the lower levels. It is neither a well-known city nor one which is much visited by tourists but has a nice mix of ancient and modern, all ameneties and some interesting historical buildings. 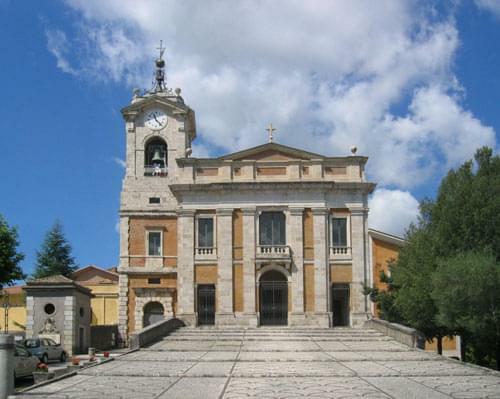 The Cathedral of Santa Maria Assunta has a Romanesque bell tower which is 62 metres high. The cathedral was extensively remodeled during the eighteenth century and contains a few interesting pieces of artwork. The Abbey Church of St. Benedict was erected in 1134 and was rebuilt between 1750 and 1797 in the Baroque style and the bell tower has two 18th century bells. This church contains the oldest art gallery in the city which holds valuable works of art dating from the 17th to the 19th century. The Santuario della Madonna della Neve (Shrine of Our Lady of the Snow) was built in the late 17th century as a rural chapel. The chapel was attacked and damaged several times over the centuries until it finally suffered serious damage during World War II. After this, in the 1950s, it was torn down and carefully rebuilt. The Church of St Magno (also known as the Madonna of Resolution) dates back to the 9th century but was heavily restored in 1747. The Chiesa di Santa Lucia was built in the 16th century specifically as a place of burial for all those sentenced to death. It was recontructed in 1840 in the neoclassical style. 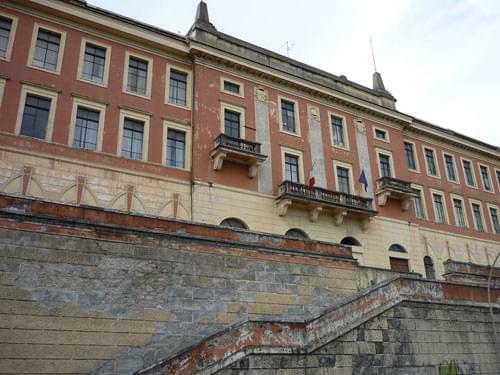 Palazzo del Governo was built in the early 19th century over the top of the old 16th century fortress of Frosinone. The building was damaged first by an earthquake in 1915, a fire in 1927 and then by heavy bombardment during World War II. It was rebuilt after the war in its present configuration of four floors and a central balcony supported by six Doric columns. The original clock tower was never included in the new structure. Internally it contains several pieces of furniture from the Palace of Caserta. 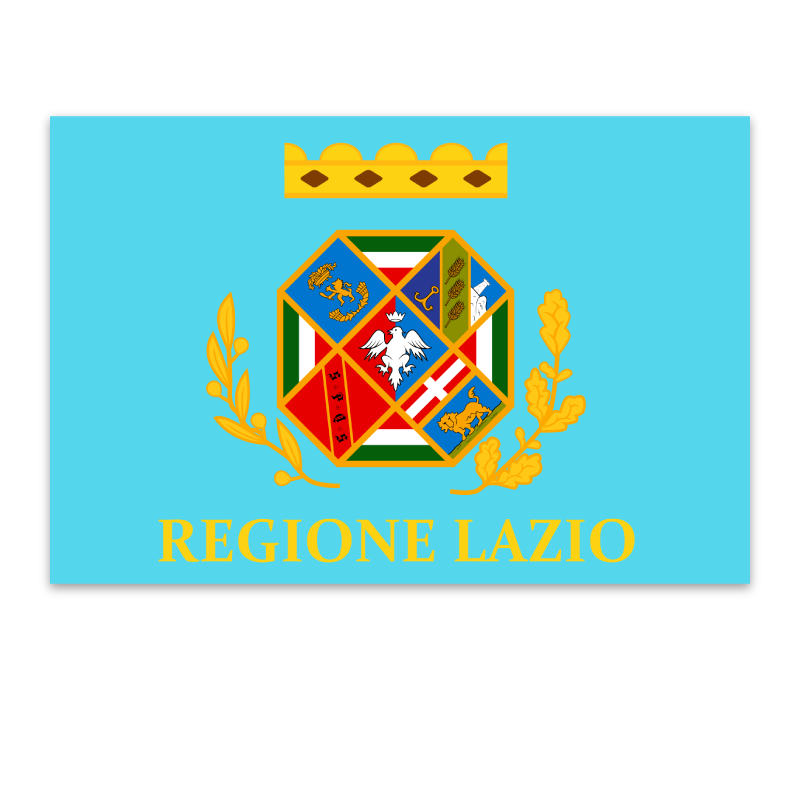 The Palazzo della Provincia is the seat of the provincial administration of Frosinone. It was constructed between 1930 and 1933 in the neoclassical style but with a reinforced concrete structure. In the entrance hall there is a lovely statue of a dancer by the early 20th century sculptor Hamlet Cataldi. Pietro Tiravanti was designed by Edgardo Vivoli and is one of the most impressive buildings in Frosinone. 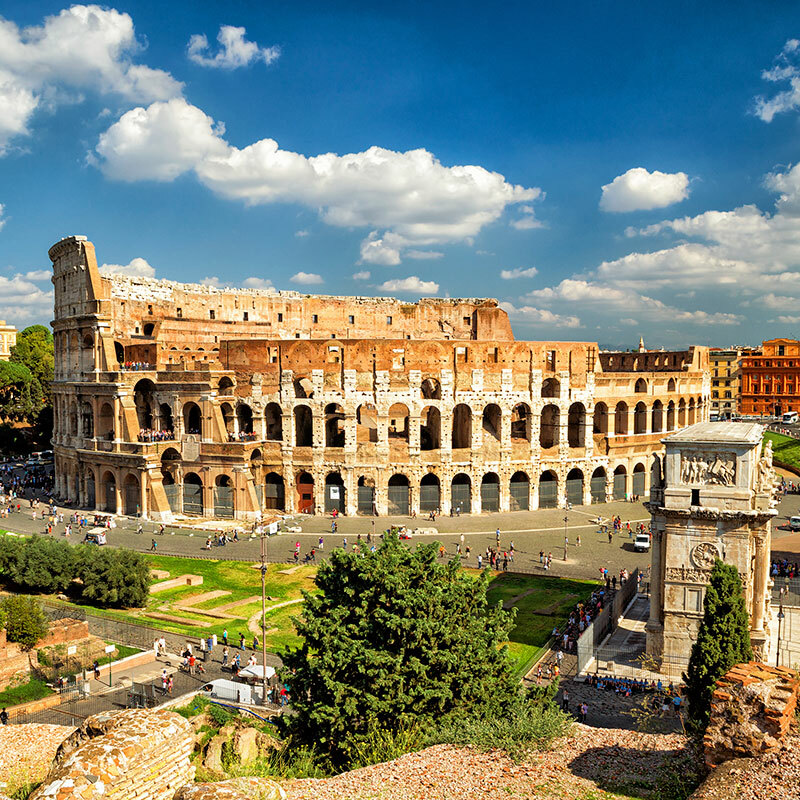 It is one of the first buildings in Italy to have been built using anti-seismic reinforced concrete. The palazzo is built over four floors and has 52 rooms, 14 halls and two staircases and is a prominent feature of the city skyline. Locally it is simply known as 'The Building'. There are two significant monuments in the city, one in Piazza della Libertà which is a bronze monument dedicated to Nicola Ricciotti. The other is the Monumento ai Caduti which is a steel sculpture in Piazzale della Pace and is in rembembrance of those fallen in all wars. The many piazzas are well stocked with bars, restaurants and shops and many of them are dotted with interesting pieces of history in the form of fountains, statues and the ruins of ancient buildings here and there. Frosinone also has many wide open green spaces including Il Parco dei Nonni, Parco delle Colline and Giardino dei Cinque Sensi. Resting in a valley running along the foothills of Monte Cairo, Cassino is best known for being the site of the fierce Battle of Monte Cassino during World War II. It is surrounded by green, fertile land with rolling hills covered in vineyards. The area is often foggy due to the its valley location. The most famous site in Cassino is the Abbey of Montecassino which sits on top of the hill just to the west of the town. This is the exact area where the Battle of Monecassino took place in 1944 and during which the Abbey was completely destroyed. It was rebuilt after the war and reconsecrated by Pope Paul VI in 1964. There are three cemeteries in the town relating to war, the Cassino War Cemetery, The German War Cemetery and the Polish cemetery. There is also a Second World War multimedial museum. 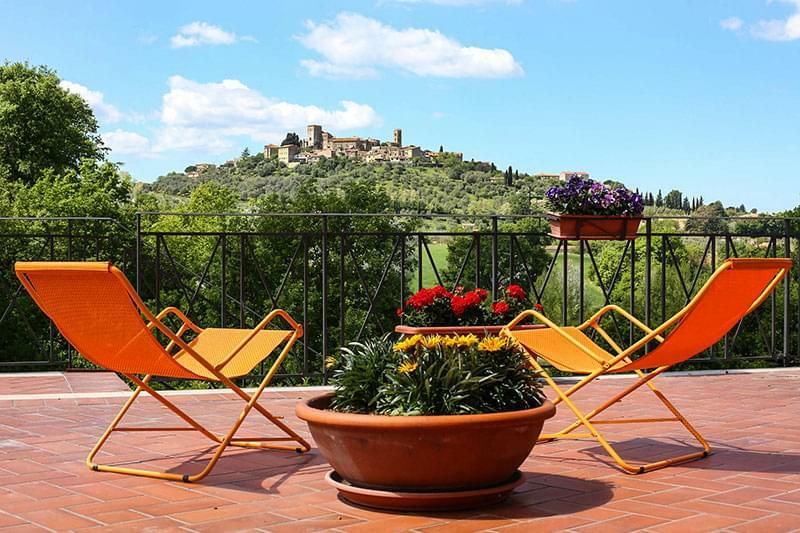 Other sites in and around the town include Rocca Janula which is a castle overlooking the city, the remains of a Roman theatre and the natural park of Terme Varroniane where natural mineral waters gush from thousands of springs. Inspite of extensive destruction during World War II, Alatri is a very well preserved town with the walls surrounding it still in very good condition. The walls were constructed from blocks made from local limestone which were put together and jointed in a way which made them strong and resiliant. The original height is believed to have been around nine metres with the wall having five gates. Two of these gates have survived and are in good condition. The Cathedral of San Paolo can be traced back to the year 930 although its current external feature are from a late 18th century restoration. The Church of San Francesco was built by Franciscan monks in the late 13th century in the Gothic style. The church of San Silvesto - a simple church built in the late 10th century contains an unusual 12th century fresco of Saint Sylvester and the Dragon. The Church of Santa Maria Maggiore is thought to have been built in the 5th century over the ruins of a temple of Venus. It was extensively restored during the 13th century by craftsmen from Burgandy. The bell tower was added in 1394 and had a cusp over it until it was destroyed in an earthquake in 1654. The Church of Santo Stefano which was built in the year 1000 but of the original structure only the main entrance remains. The small 15th century church called 'Chiesa delle XII Marie' which means 'Church of the 12 Marys'. Gottifredo Palace which was built in the mid 13th century and is a large building consisting of two towerhouses, both of different styles. It now houses the town musuem. The Castle of Osteria di Alatri. 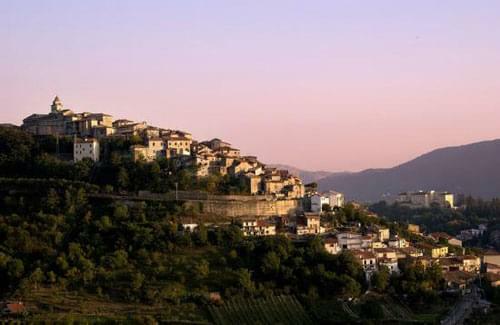 One of the oldest castles in Italy can be found on the hilltop overlooking this small village. The castle is in ruins but these are actually in good condition and even parts of the surrounding walls remain. It is well worth climbing up to see not only the castle but also the views of the village and surrounding area from up there. In the village itself stretches out along the lower slopes below the castle and contains some well preserved historical buildings including the Renaissance style Palazzo Ducale built in the latter part of the 16th century, the baroque Church of S. Teresa and the remains of the monastery of s. Nicholas. This small medieval down rests on the ridge of a hill 475 metres above sea level and is still contained by its original Roman walls. The town is divided into eight districts and the steep, narrow streets twist and turn between them. 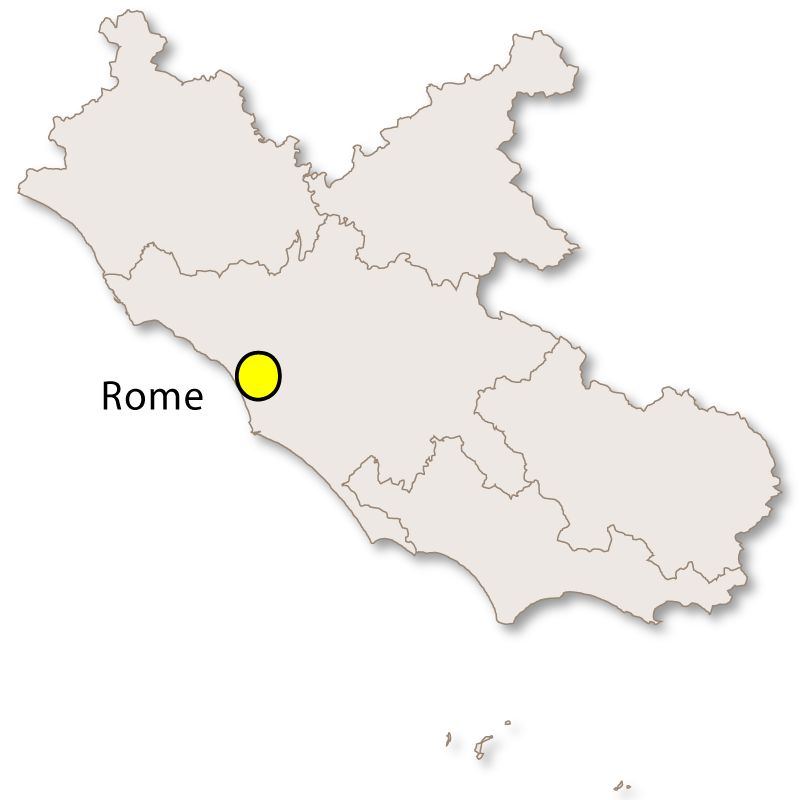 First human settlement in Anagni can be traced back over 700,000 years. 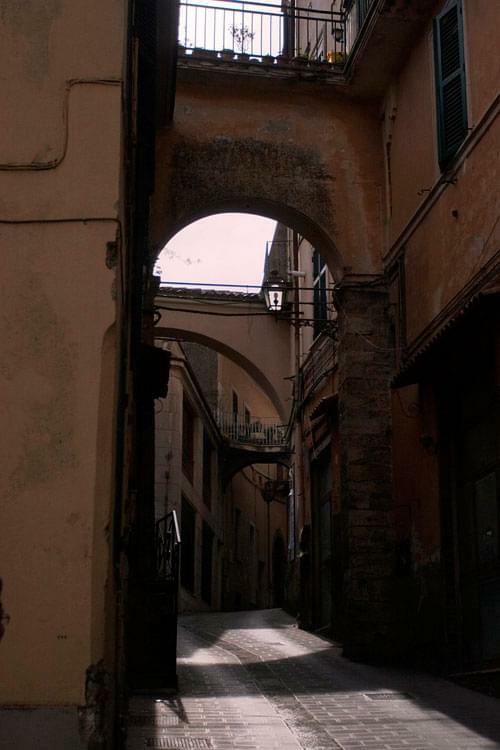 The old historic centre can be entered by one of five ancient gates, Porta Cerere, Porta S.Maria, Porta S.Francesco, Porta Tufoli or Porta San Nicola. The Cathedral of Anagni which was built between 1071 and 1105 with some Gothic style architecutre added during the middle of the 13th century. Internally it has frescoes covering the walls and ceiling and these are considered to be some of the best examples of Romanesque/Byzantine art in the whole of Italy. The Communal Palace built in 1163 from two existing buildings joined together by an imposing portico. 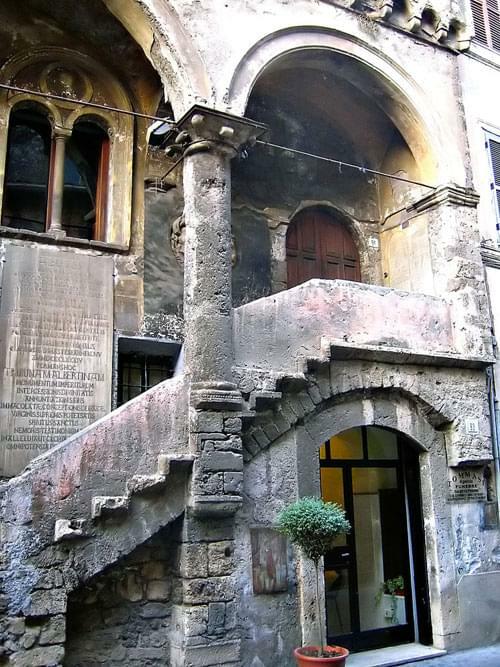 Casa Gigli is the medieval palace where it is believed that Dante Alighieri stayed during his visit to the city. It was bought and carefully restored in the mid 19th century by a Swedish painter called Albert Barnekow. Casa Gigli is now commonly known as Casa Barnekow. Well known for its production of fine wines including Cabernet Sauvignon, Syrah and Merlot. Interesting sites within the village are the 11th Century baroque Cathedral, the Gothic Ducal Palace built in 1349 and the 17th century Convent of St. Francis. Dating back to pre-Roman times this small town has prehistoric Pelasgic walls and was once one of the most fortified towns in the region of Lazio. Within the town there are many Reneaissance palaces and churches, one of which contains a mosaic attributed to Giotto. Situated within the boundaries of the Monti Aurunci Natural Park, Esperia found itself in the new in 2006 when dinosaur footprints were discovered nearby. 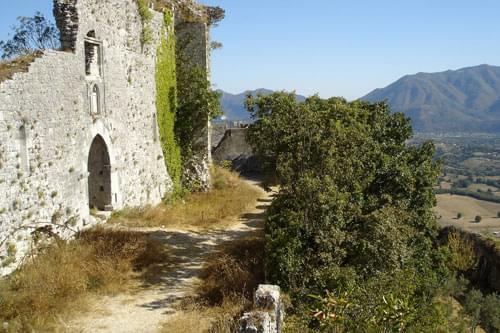 There are the remains of a castle, the 16th century Sanctuary of Madonna delle Grazie and several pretty churches. 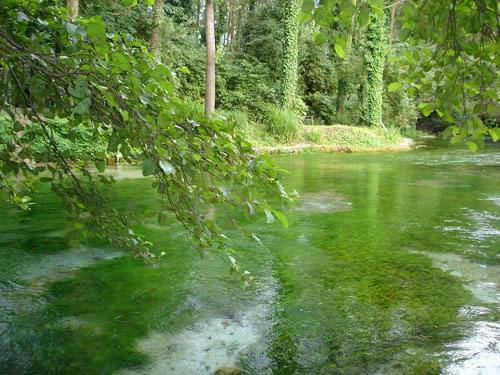 Several natural springs flow into Fiuggi from the nearby mountains and as early as the 14th century the water was discovered to have natural healing properties. The mineral water from Fiuggi has been proven to be effective in breaking down and flushing out kidney stones from the body and helping to improve kidney function. It is also thought to be helpful in getting rid of gout and uric acid and there is also a possiblility that it may increase the metabolism. As a result of a thirty year advertising campaign with the slogan 'Fuiggi - the water that keeps you young', many Europeans drink the water daily and it is sold in a vast number of supermarkets and served in restaurants all over Italy. Due to the water the town of Fiuggi has become a popular spa resort and there are several spas where the drinking of this water is included in the treatment. In the town itself there are two springs, Fonte Bonifacio and Fonte Anticolana and thousands of tourists flock there every year to drink the water. Fiuggi, like many Italian towns is split into two parts, the old town which is usually higher and on lower which is where the more modern buildings are. The shopping here is excellent with loads of really good restaurants with healthy, homemade food and, of course, Fiuggi water. There are the ruins of a castle and some really pretty and tiny churches as well as ornate palaces and stunning piazzas. 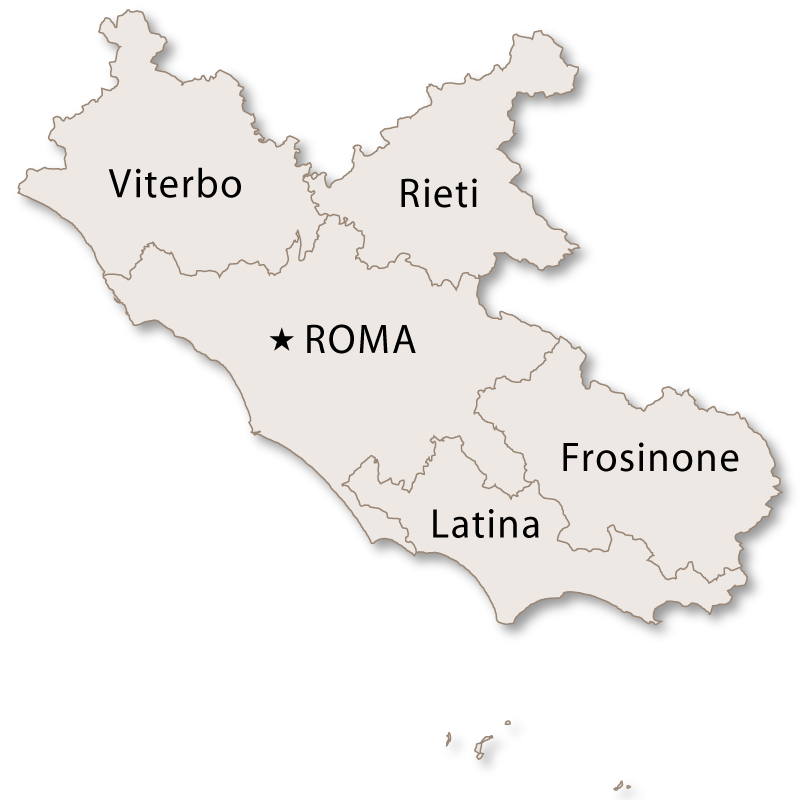 Although classed as an island, the town of Isola del Liri is actually just situated between two branches of the River Liri. The main site here is the Castello Boncompagni-Viscogliosi which is a fortified palace set next to two waterfalls. The waterfalls are called Cascata Grande and Cascata del Valcatoio and each one is around 30 metres high. The exact date of the palace is not known but it was first mentioned in the year 1100. 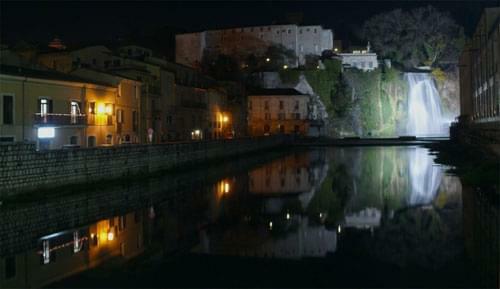 Isola del Liri is also famous for its blues festival which has been an annual event since 1988. The concerts are held in Piazza Boncompagni, are always free and usually result in late night jamming sessions. 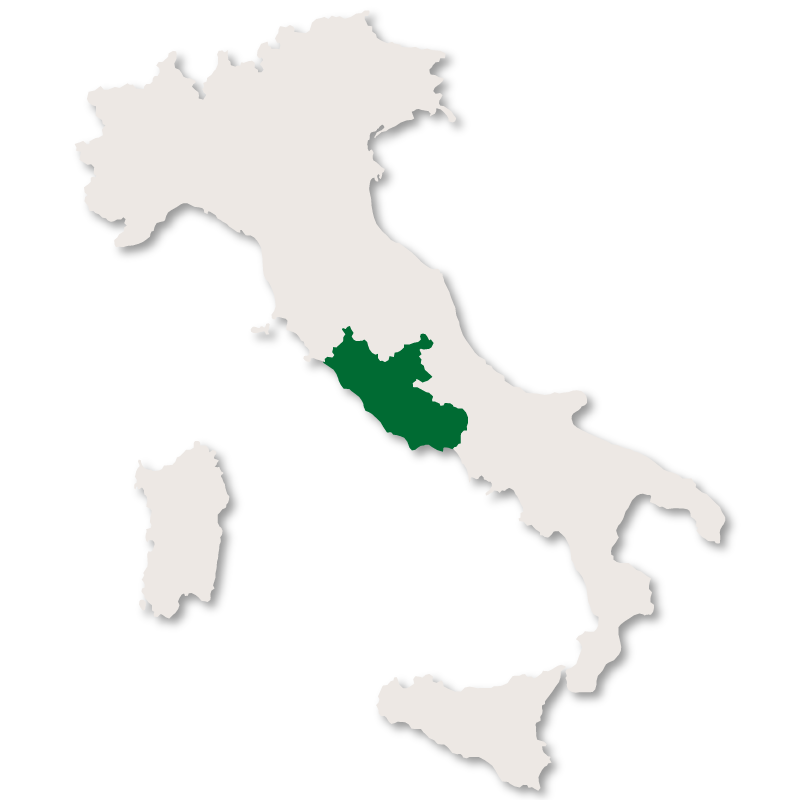 As a point of interest - Isola del Liri is twinned with New Orleans.